EASEUS Software has launched CleanGenius 2.0 Free, a cleaning tool for Mac users. CleanGenius is the new name for MacCleaning, which debuted just over a month ago as EASEUS’s first foray into the Mac market. Also available with several additional features as a paid-for Pro version, CleanGenius 2.0 adds a new uninstaller component and extends the user’s control over existing cleaning tools, all wrapped up in a redesigned user interface. MacCleaning was launched with three core tools: the ability to automatically clean system and user logs and caches (plus Downloads and the Trash) with a single click, a quick-and-easy drive monitor and buttons for unmounting drives with a single click, plus a low disk space alarm, which alerts the user when the drive is 90 per cent full. CleanGenius introduces a new user interface that allows users to manually scan their drive instead of clearing it to see how much space can be recovered. Additionally, additional components can be scanned and files manually removed from the default selection before the logs or caches are cleaned, giving the user full control over the process. There’s also a brand new uninstaller component: a list of all detected applications are displayed, and the user can remove applications -- including preferences, caches, logs and other associated files -- simply by ticking the application and clicking Uninstall. Multiple applications can be removed at once, but the feature should be used with caution: all files are directly deleted from the user’s hard drive, and there’s no means of finding out exactly what files have been selected along with the application for removal. A quick trip to CleanGenius’ support page reveals that the app searches common locations such as the user’s Library/Preferences and Library/Applications Support folders, but it would still be nice to see what files have been detected before going ahead with the app removal. 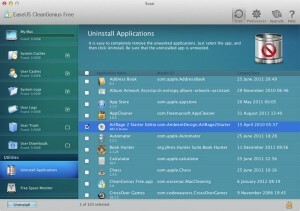 EASEUS CleanGenius 2.0 Free is available now as a freeware download for Macs running OS X 10.6 (Snow Leopard) or later. A Pro version costs $12.99 and includes a smattering of additional features, such as user-configurable low drive space alarms, the ability to unmount all removable media with a single click plus an option to reveal selected items in Finder.